Let me get this straight. We were supposed to believe a fully sedated man sat up in bed while his doctor, who was being paid $150,000 nuts a month was out of the room while Michael prepared a complicated injection for himself because he was suicidal?Ch’mon. Propofol is injected via slow drip, not just by jabbing a needle in your arm. Michael killing himself wasn’t going to fly. That’s not a viable line of defense. Or as Dr. Shafer explained at the trial. “People don’t just wake up from anesthesia hell-bent to pick up a syringe and pump it into the IV, It’s a crazy scenario” as he explained how complicated the procedure was. 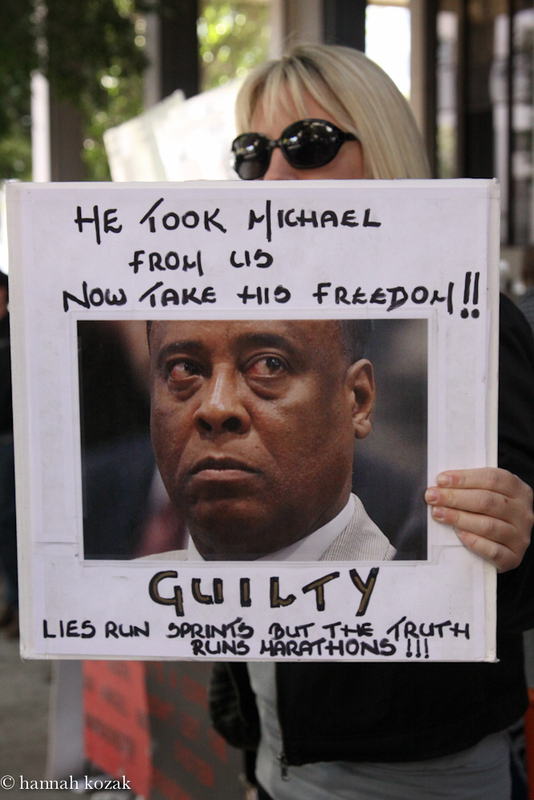 And that is part of why Conrad Murray has been sentenced to four years in custody for the death of Michael Jackson. 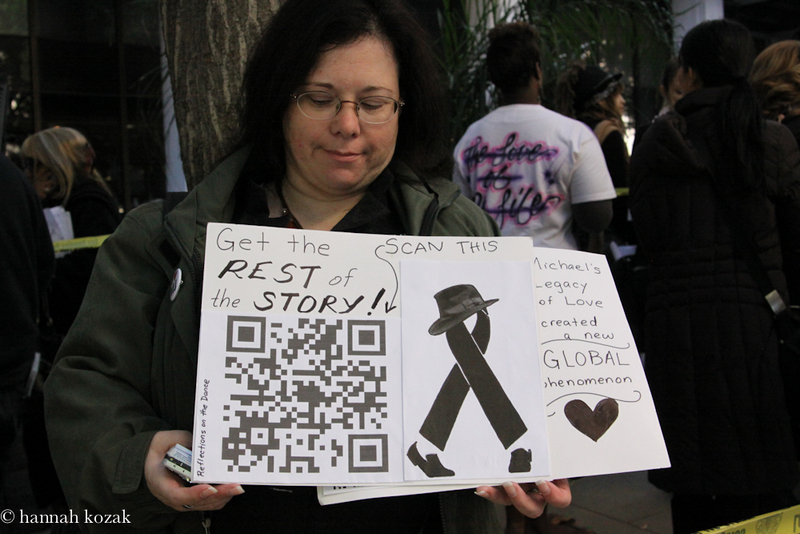 Here is a rap re-mix of MJ’s Monster by Bigspookloc and the lyrics by Justice4MJ, which is organized by Erin Jacobs and Amy Kimes, who have rallied and organized fans around the world. 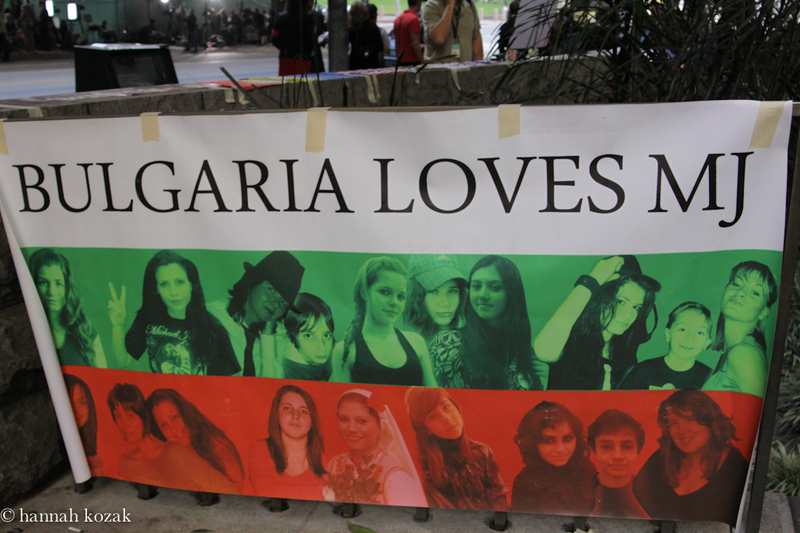 I love the passion of MJ fans. 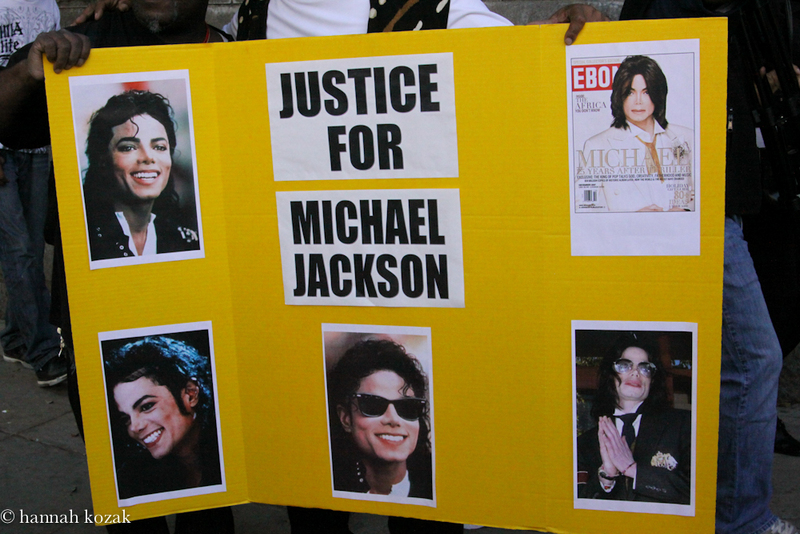 They write songs, show support with signs, organize banners, travel internationally to see where Michael lived. Murray’s defense kept crumbling. 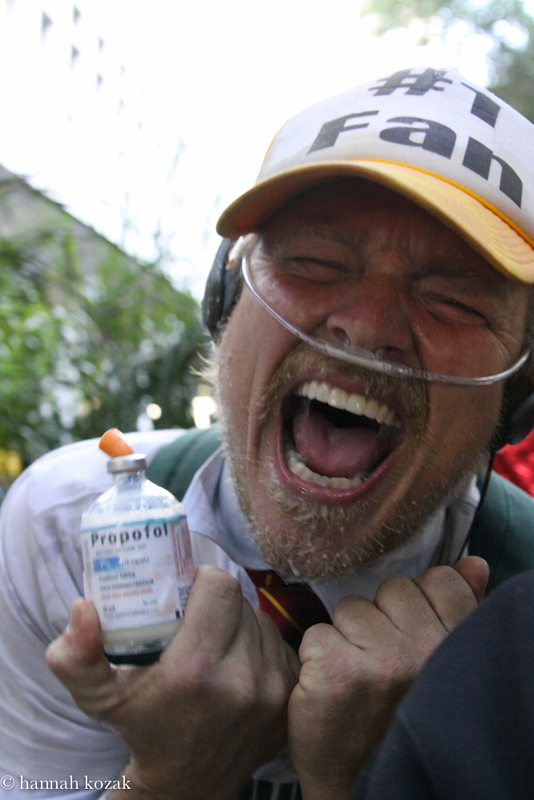 If he was trying to ween Jackson off propofol, why did he order 4 gallons? Murray was so grossly negligent, it is criminal. If Murray really was a friend to Michael as he stated he was, he would have enlisted help so Michael could sleep. Friends don’t let friends use propofol. 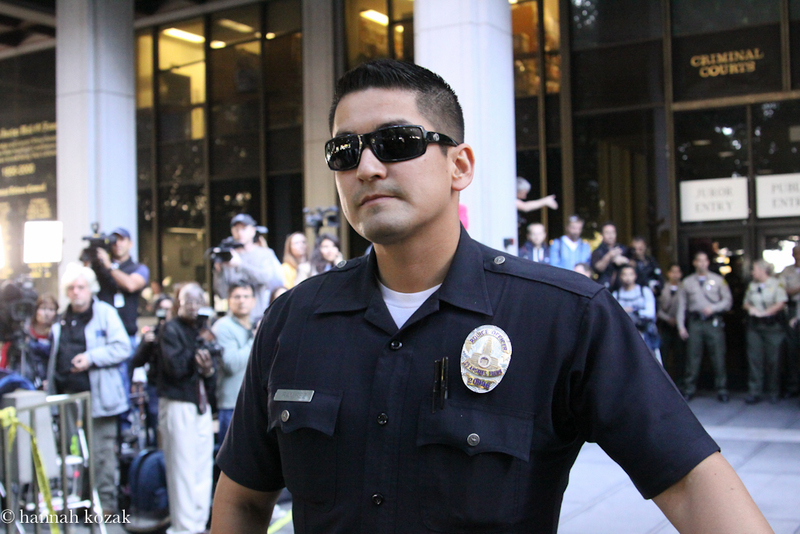 Here are some photos from the courthouse today. 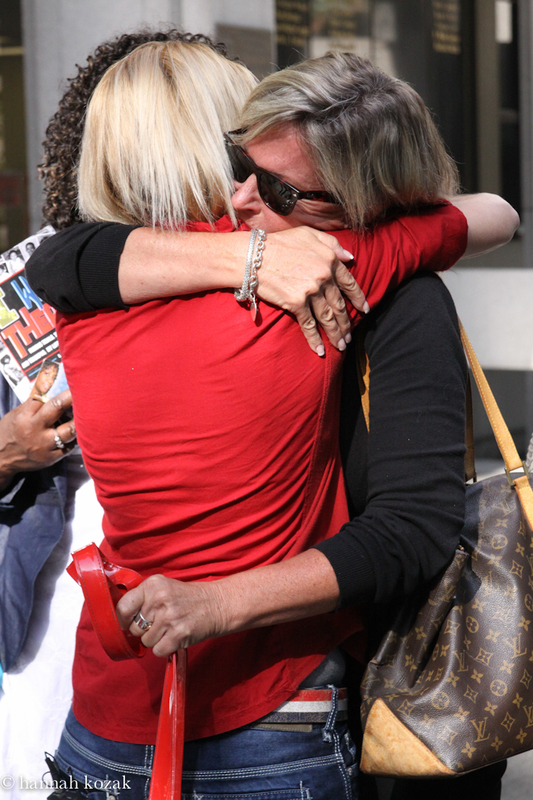 Jackie Papier from Redondo Beach said “the day I’m celebrating is when the sentencing came down. 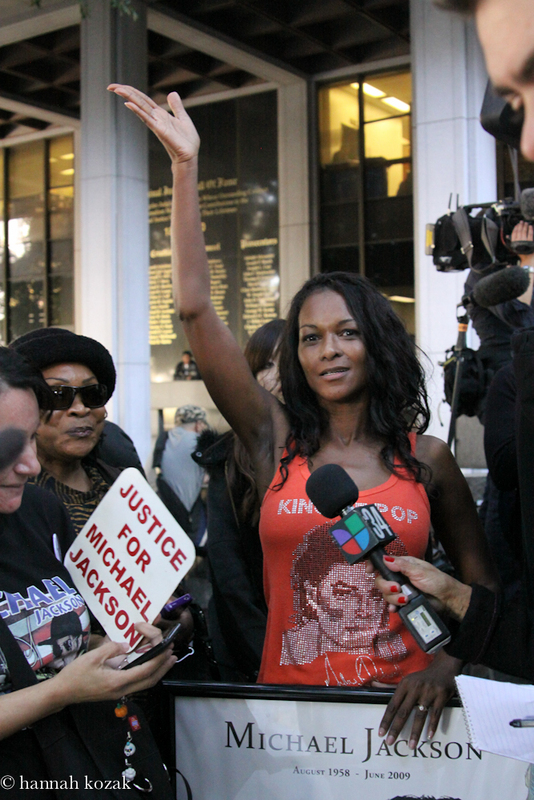 I’m happy for the prosecution.” She created this t-shirt which she sells and gives the proceeds to two of Michael’s charities: Center for Apes & Unicef. Taaj Malik is a treasure who has been fighting relentlessly for years on behalf on Michael Jackson with dedication and devotion. She fought to make sure that Michael’s charity would continue as he wanted. I love Taaj, she never, ever backs down. When you are being paid to monitor your patient and keep him alive you don’t diddle daddle in another room while patient is on a slow drip of propofol. How about the fact that propofol was being fueled into Michael’s veins even after he was dead? When will the travesty against this man end? The lack of humanity was stunning. Murray violated every standard of care while operating outside his area of speciality. No monitoring equipment, delayed calling 911, a botch job on CPR, hiding evidence, lying to paramedics, lying to UCLA doctors, and injecting MJ with a lethal dose of propofol. Not to mention shipping propofol to his girlfriends’s house. Talk about a non-existant morality. His hubris and lack of regard for Jackson cost his life. Oh, and tape recording Michael in the privacy of his own home, his own bedroom. What was Murray planning to do with that? His story changed four times at the last count. I find it deplorable that Murray’s defense was banking on twenty years of lies, false accusations, skewed stories and sheer brutalization. Maybe when Murray goes to jail, his lying lawyers can visit him with some sleeping pills, anti-anxiety medication and maybe twenty-five mg of propofol. This trial began long ago not June 25, 2009. It began in 1993 when Evan Chandler blackmailed MJ for twenty million. When he didn’t get what he want, he sought to destroy MJ. 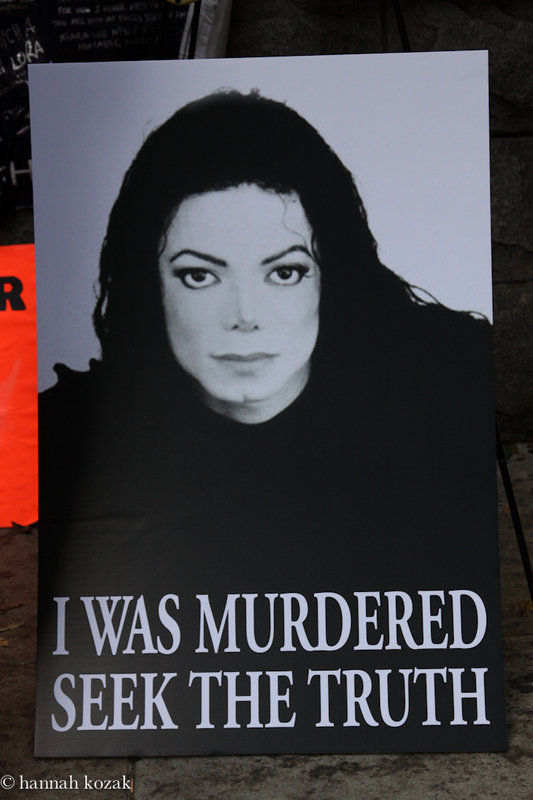 MJ was the victim of a 21st century lynching while the media loved the news and the scandal. 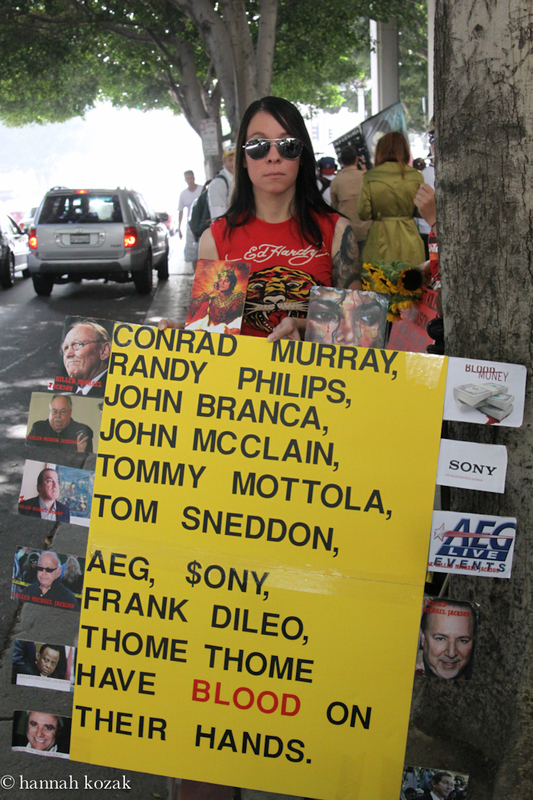 Thomas Sneddon, the vindictive DA of Santa Barbara, was crazed in his desire to destroy MJ. MJ was victimized twice, Conrad Murray ran for 3rd base and hit Michael right out of the park. The lies continued when Gavin Arvizo’s desperate mother Janet decided to come up with the preposterous tale that MJ molested her cancer stricken son. Since when did character assassination become part of a trial? This is what MJ lived with and died with. When will we learn the lessons. We need to stop blaming the victim. MJ was known to have insomnia when he toured. His stress levels were on overload. How about if Murray told the truth about this talented philanthropist and entertainer. The defense wanted to slice the pie and hand out pieces of blame. 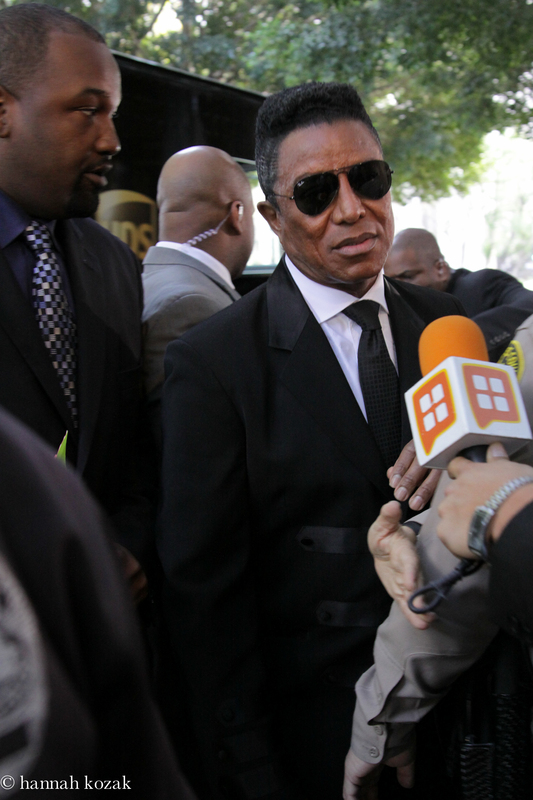 Conrad Murray baked the pie and he overcooked it forty-seven minutes too late while he was on the phone. Oh, and propofol is only usable for twenty four hours after it has been opened or punctured. How about the fact there were open propofol bottles all over MJ’s bedroom? The media doesn’t reflect the facts. When it comes to Michael Jackson, it is about profit and always has been. Propofol should never be administered in any setting other than a hospital with life saving monitoring equipment not some quack sitting by texting and calling girlfriend(s). Since when do you put someone under anesthesia and then gab on the phone? I think of most people as balls. We see balls bounce and roll around. They’re resilient, mostly predictable and, no matter what angle you look at them from, they always look the same. But occasionally, we see a person who is an egg. Those are the extraordinary people. To the many balls, the few eggs look and behave oddly, and they clearly are not their kind and don’t fit in. Some of us are ordinary, conforming, uniform balls and others have no choice to reach in search of our limits and, as a result, stretch ourselves out of shape into eggs. It’s apparent Michael was an egg. There is something about all that stretching that seems to make eggs fragile. 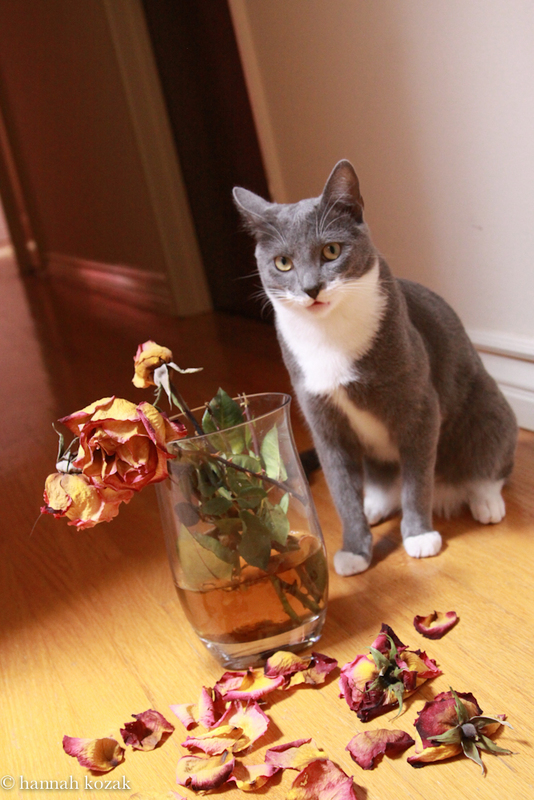 If you throw them onto the floor or up against a wall, you can be sure they are going to break. We all know that. 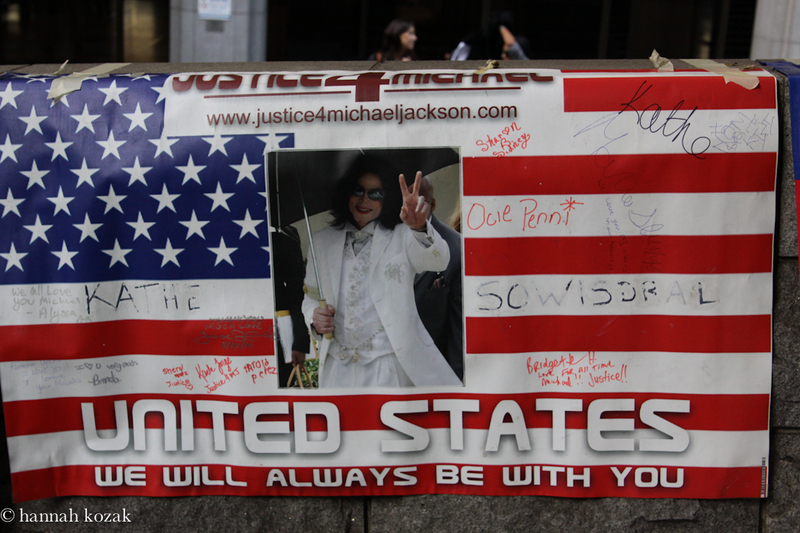 America was determined to break Michael Jackson into little tiny pieces. Then the media was focused on MJ sleeping with a doll for more media sensationalism during this trial. When will American media obsession with journalism of personal destruction stop? We have waited so long for this trial. 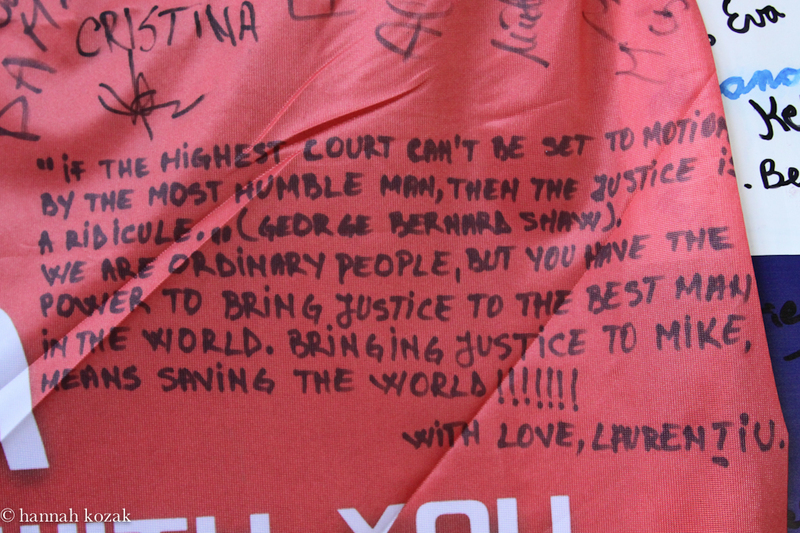 Did justice prevail? Michael Jackson meant so much to me, not only as an artist but as someone who cared about humanity. He cared about our planet, he cared about children, he simply cared. His neglected childhood would be the catalyst to the makings of a complex man. I think Michael was always a child at heart. As far as MJ being strange, I applaud his unique ways. Aberrant, abnormal, astonishing, astounding, atypical, bizarre, curious, different, eccentric, erratic, exceptional, extraordinary, fantastic, far-out, funny, idiosyncratic, inexperienced, irregular, marvelous, mystifying, new, newfangled, odd, oddball, off, offbeat, out-of-the-­way, outlandish, peculiar, perplexing, quaint, queer, rare, remarkable, singular, unaccounta­ble, unaccustomed, uncanny, uncommon, unheard of, unseasoned, unusual, weird, wonderful. Being different was nothing to be ashamed of. He had a pure heart and he was able to reach people emotionally with his unique gift from G-d. He was among the kindest souls to ever walk the planet which is why so many loved him. With A Child’s Heart is one of my favorite songs. It was Michael Jackson’s anthem and it was what he lived. A child’s heart sees no danger, hatred, sadness, or prejudice, but rather love, peace, and unity. Heavy was the head that wore his crown. He carried a lot of pain, disappointment and sheer loneliness that seemed to plague his heart his entire life. Michael was a mirror, mirrors always show us the truth whether we want to see it or not. It’s too scary for most of us to look at ourselves so we spend time bashing someone we never knew. MJ had nothing but pure love and goodwill in his kind heart and never hurt a soul. America met him with judgment, resentment, deceit, lies, bigotry, hypocrisy. Why? Because he didn’t womanize instead he preferred being around children and animals.He brought beauty and joy to our world. I would have loved to have been friends with him. Climbing trees, water fights, Disneyland, playing with animals, watching movies. Yes, if that is odd, then I’m on board with the odd train. Troubled soul? Half our planet is filled with troubled souls. Myriads of us walking around day after day but we don’t have the media dropping the ball on our every move. Of course, half the planet took the gossip and dirt and ran with it. Oh, and by the way, I sleep with a doll. “A faint cold fear thrills through my veins that almost freezes up the heat of life.” Thanks Shakespeare. We had justice for approximately 24 hours. Scratch the sense of closure I wrote about 2 days ago. When I heard the recording of Michael Jackson’s voice where Michael was taped in the privacy of his home, I knew what Dr. Murray was up to all along. Think about it. There are no words that exist in the English language for Murray’s ethics but appalling comes to mind. Murray was sitting in Michael’s bedroom with his iPhone tape recording Michael. What exactly was he planning to do with that? Michael was in the privacy of his own home and still had no privacy.What a horrific violation of trust. Is the media a mirror of society? If it is, then we have hit rock bottom. It’s obvious why Murray choose not to testify in court. He had this planned all along complete with a tape recording he made of Michael’s voice. I wonder how much he was paid? Channel 4 is ready in the wings with a diabolical documentary featuring an exclusive interview with Murray, the doctor who was found guilty in the death of the world’s most beloved entertainer. How much money will Murray pocket from his documentary? How far will the tabloid trash reach? I wrote a blog about Money last week and I wasn’t far off. There are laws that prevent a felon from profiting from his crime but not if the documentary was completed prior to the end of the trial where Murray was considered innocent. Congratulations to Murray who got around the law again. Michael Jackson was making money from the time he was eight years old. He grew up knowing that people wanted to be near him for his money. He knew that many did not care about him and his giant heart that cared about people, children, families, art, animals, nature and his fans. From Evan Chandler to Janet Arvizo to Martin Bashirs to Rabbi Schmuley to Conrad Murray, we come full circle to what Michael Jackson endured his entire life. Who could he trust? No wonder he filled his bedroom with mannequins when he was 20 years old. At least he could speak to someone who wouldn’t record his thoughts or publish a book of his deepest sorrows. No wonder Michael preferred the company of children to adults. Greedy people saw money signs when they looked at Michael and Michael knew that. The only thing Michael Jackson was guilty of was trusting the wrong people. 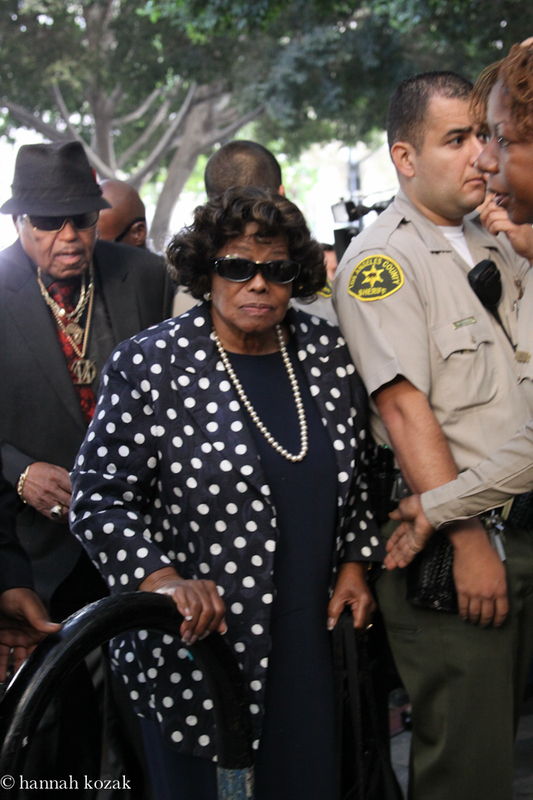 Conrad Murray was found guilty of involuntary manslaughter just two days ago. Why isn’t he hanging his head in shame? Instead a documentary is going to be aired next week! Michael Jackson is dead because of Murray’s negligence and now we have to fight the network to cancel an inappropriate show? Why is it a constant battle with us against the media to simply DO THE RIGHT THING.It is inconceivable that a killer be allowed to profit from his victim, the person that he killed. It is inconceivable that a doctor releases personal information on one of his patients. It is inconceivable that our justice system allows a criminal to become a millionaire after killing a celebrity. What kind of messages are we sending to the children? 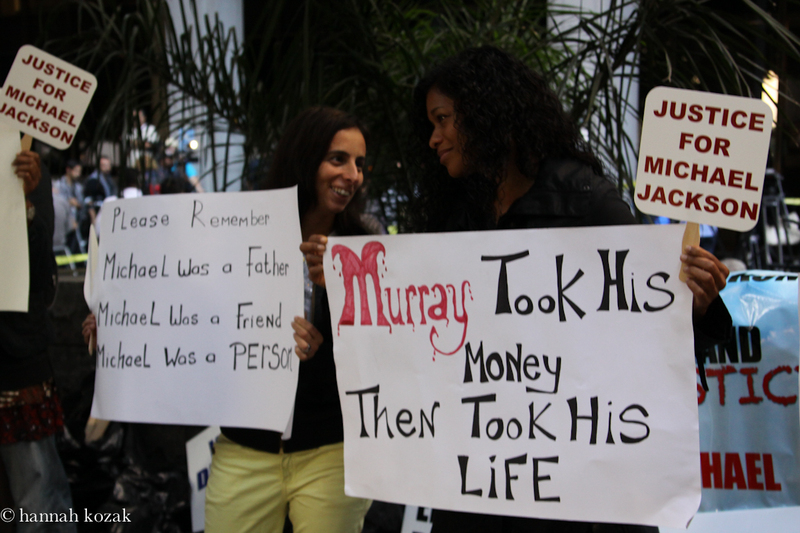 Because Murray got caught up in the money that came with pop superstar Michael Jackson. 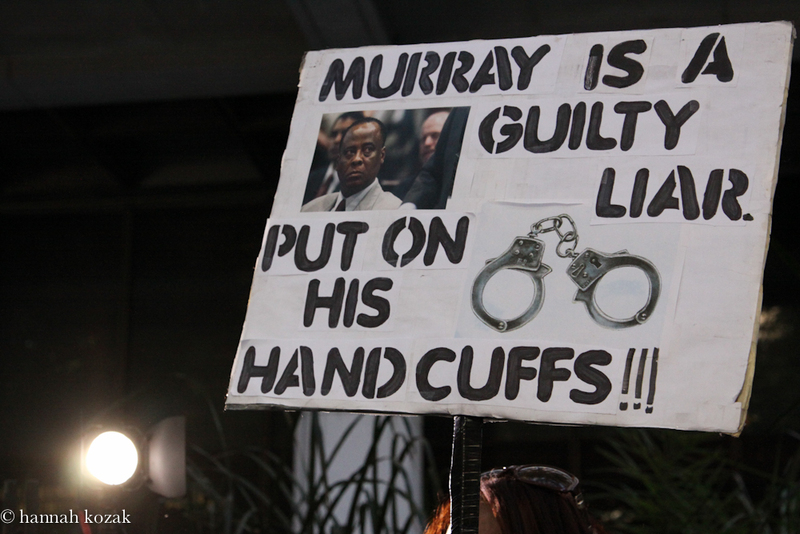 We saw the testimony of all of Murray’s various women. Murray boasted that he was Michael Jackson’s doctor. It was part of how he seduced women. 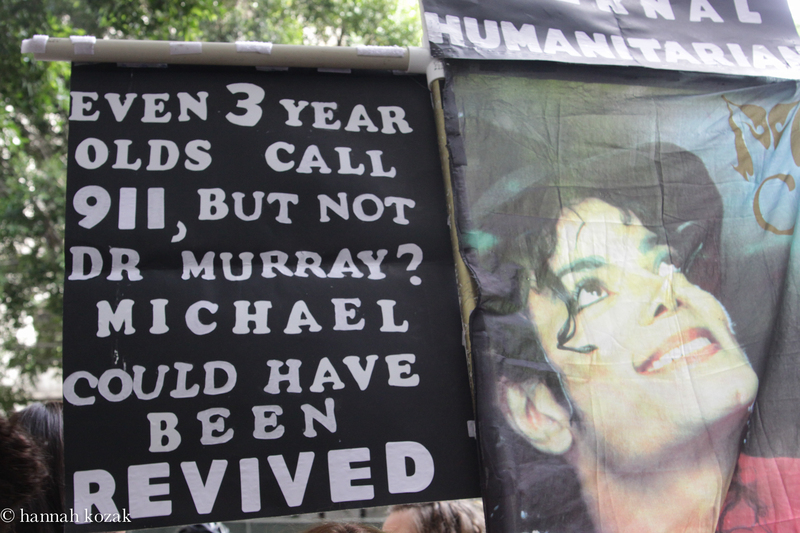 His “care” killed Michael because of Murray’s greed. I am disturbed, appalled, upset by how wrong this is. Here we go again. Was justice served? Murray’s attorneys are going to appeal the verdict. What will Murray serve? He got 4 years but honestly visa vi the new statute going into effect his crime will be a jail felony so 4 years becomes 2 years. He’ll get good behavior and our jails are full. Murray will serve around 7-14 months then he’ll get book deals and he’ll head off to Europe with his money and what about the fact that Frank Dileo is dead. How come no one addressed that when Murray came down the stairs in a panic and called for Prince that Kai, the chef, just went back to cooking the meal? What about the catalogue? I want to know what about the Sony/ATV catalogue? The bottom line is they got away with murder. Everyone knows Michael was concerned that he would be killed so his catalogue could be controlled. 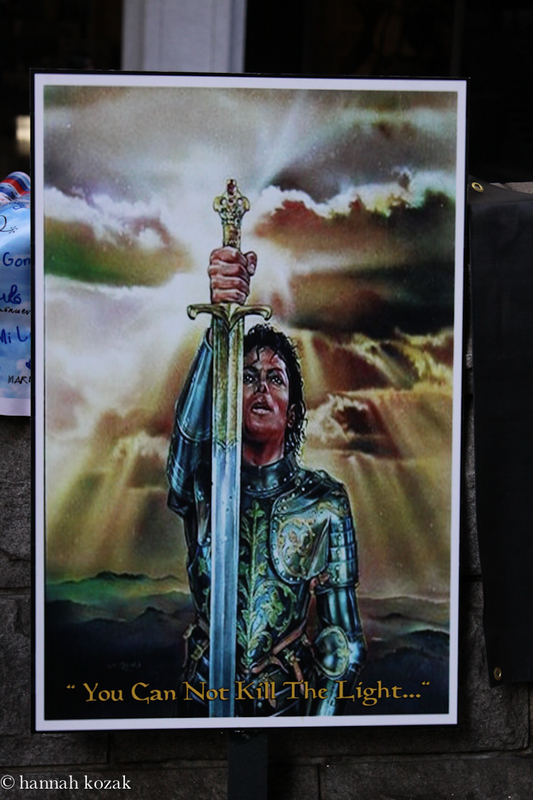 Art transcended Michael’s troubles when he was alive but I suspect that we’ve only just begun the fight. Here’s my truth. My mother was the victim of abuse and her abuser walked away free. No justice was served and I had no voice as a 14 year-old girl. I have a voice now and I’m going to keep using it until I can’t anymore. Michael Jackson doesn’t have a voice anymore. We all must gather forces and be a voice for him. We stopped the program that was going to air where a live autopsy would be done on his cadaver. We can stop this programming. Commit to not watching the program and persuade everyone you know to do the same. Let’s twitter something more important than the best place to get a facial or eat lunch. 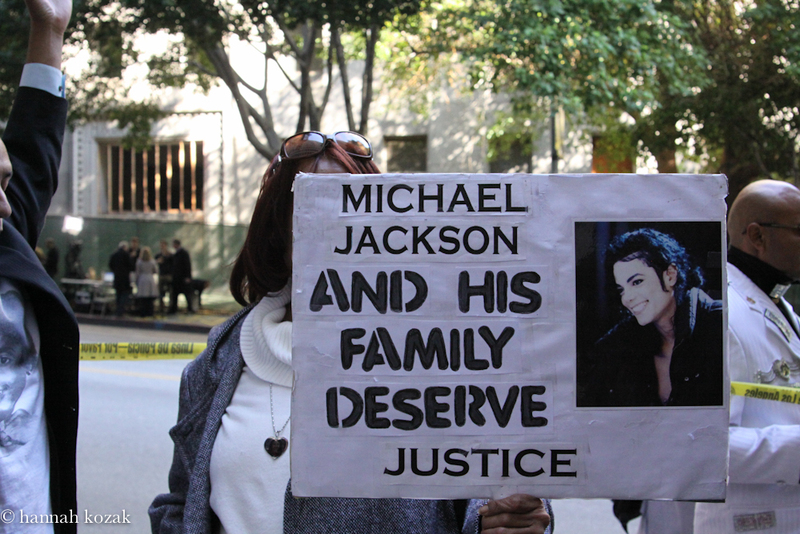 Let’s continue the fight for justice for Michael please. Michael was treated differently than you or I his entire life because he was 100% unique. He’s been on trial most of his life. The media ignored his philanthropic endeavors and they invented salacious lies about him. 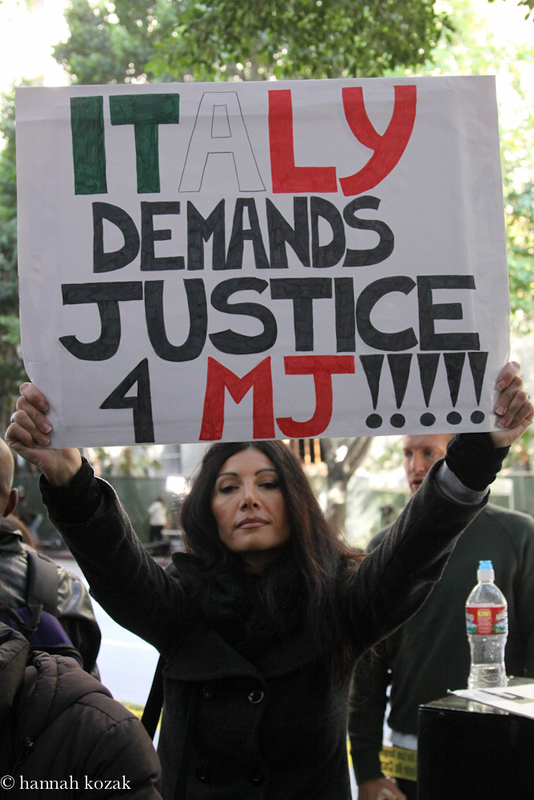 Even if you aren’t an MJ fan, it’s time to raise your voice. It’s time to get indignant and call, write, tweet, fax, share, spread and don’t stop. Where is the humanity? Michael Jackson died on June 25, 2009 from acute propofol poisoning, while billions of people around the world cried, sharing their grief and anguish with each other and in the silence of their solitude. 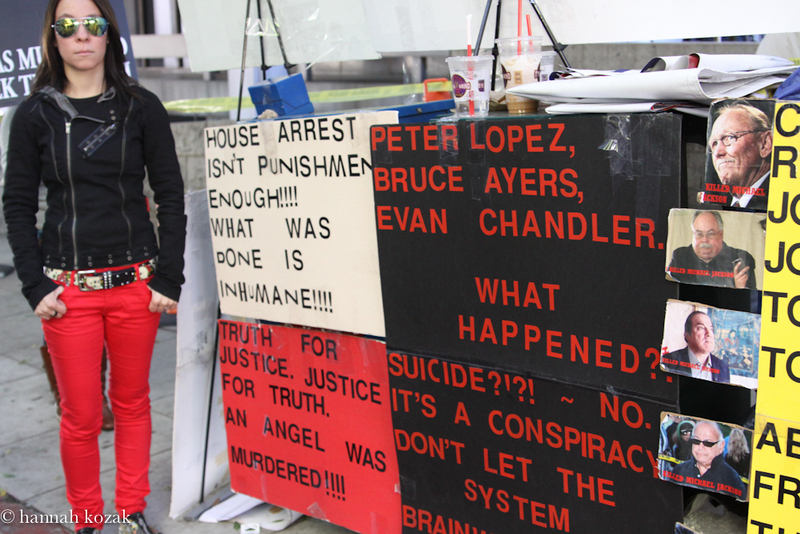 The day we have been waiting for over 2 years is here as the fans at the courthouse patiently waited with their hand made signs. 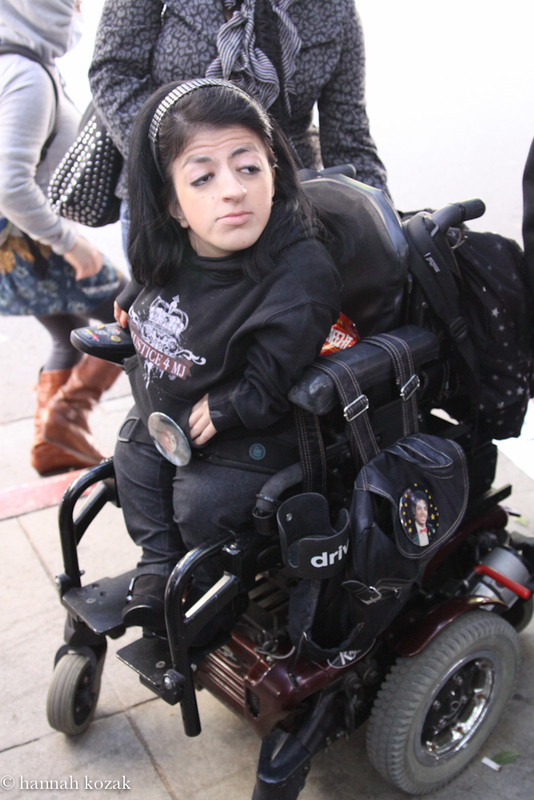 Cami is 21 years old and has loved Michael Jackson since she was a little girl. 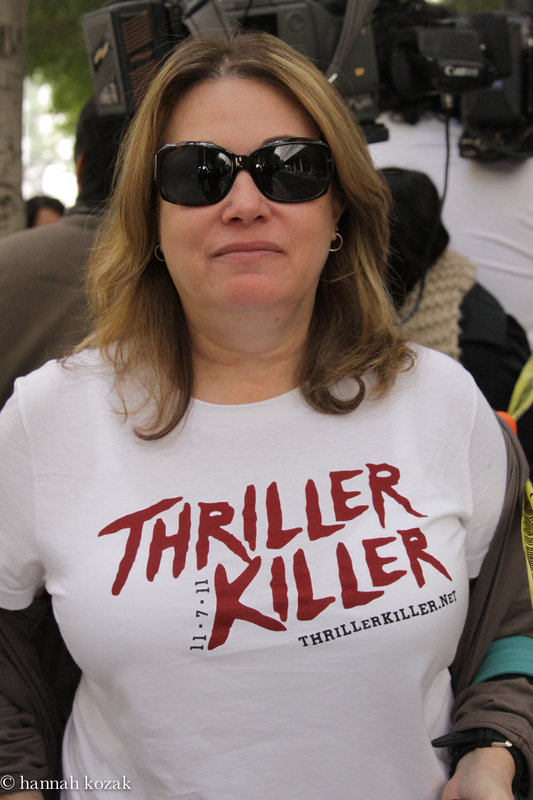 She came out today in support of Michael because she loves him. 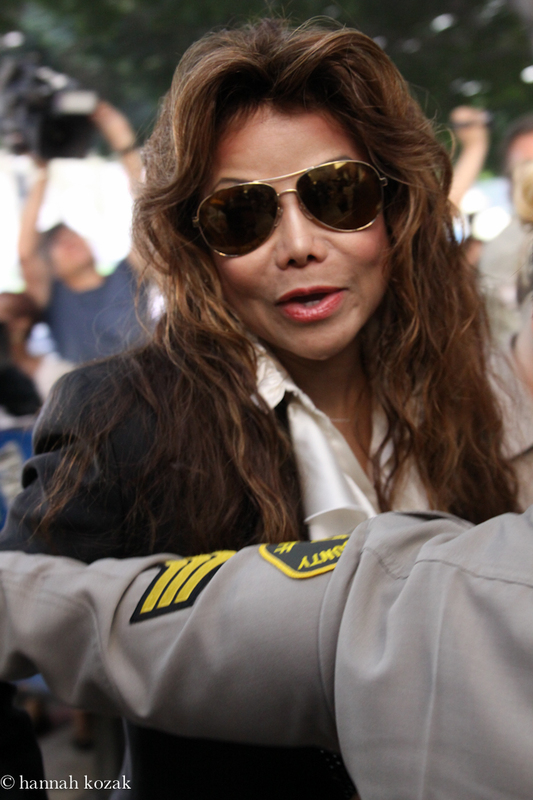 When the guilt verdict was announced today, La Toya Jackson let out a loud but short scream as there were cheers, hugs, tears and people chanting “justice, justice, justice” as we waited for the Jackson family to exit the court house they’ve become all too familiar with. Michael’s message of love, pure and simple, was delivered through his music. I was hurt at work the day he died. I couldn’t quite grasp the concept of him being gone as his music has been the soundtrack to my life as far back as grade school when I would listen to Going Back To Indiana on my record player while dancing and clapping with my friend. I had a spiritual ephiphany when we lost Michael. Like Rita, I was living my life when I began Michaeling. Michael Jackson graced our planet with his enormous talents. Where he connected with me deeply was his caring, compassionate other centered-heart. 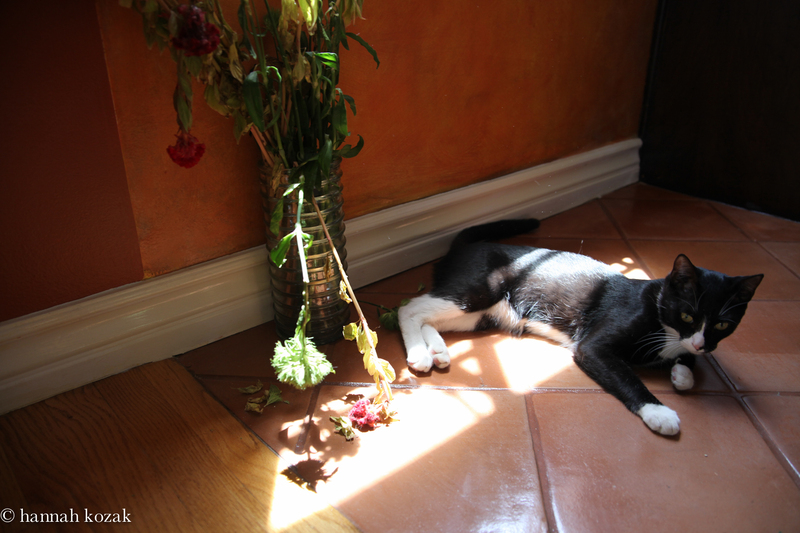 From the time he was a young boy, he was feeding mice behind the refrigerator until he got caught. Mice, rats, snakes, he loved all of god’s little critters. He didn’t have a mean bone in his body. I watched interviews of him at Hayvenhurst during the Thriller era. He must have said the word magic a dozen times as his eyes sparkled with light. Michael was filled with joy, light, love, laughter with the innocence of a young child. As his magical music climbed the charts and he broke all records, the media told fantastic lies and would eventually be part of trying to extinguish his light. Darkness always tries to snuff out light bearers. He’s not physically with us anymore but he leaves behind a legacy of music and love that will be with us forever. “This is not a crime involving a mistake of judgment. 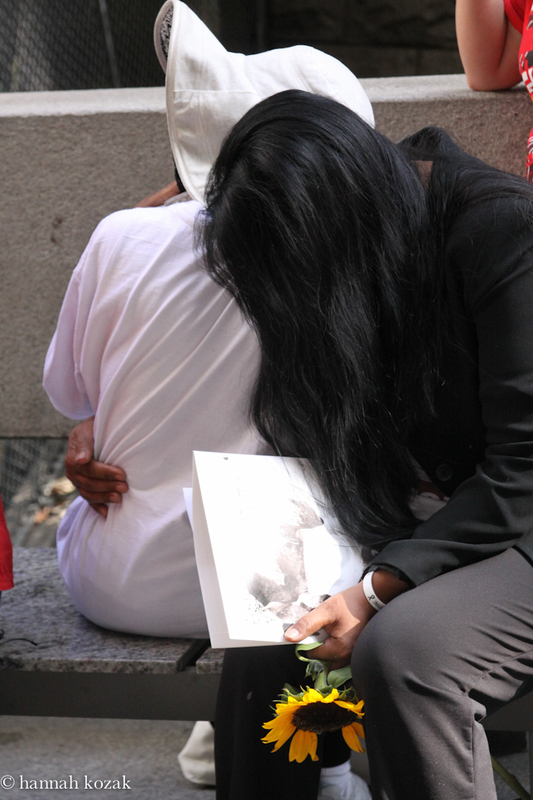 … This was a crime where the end result was the death of a human being,” Pastor said in explaining his decision to remand Murray to police custody. Justice has been served as we finally have some type of closure for the greatest entertainer that ever lived with a heart that loved so grand. 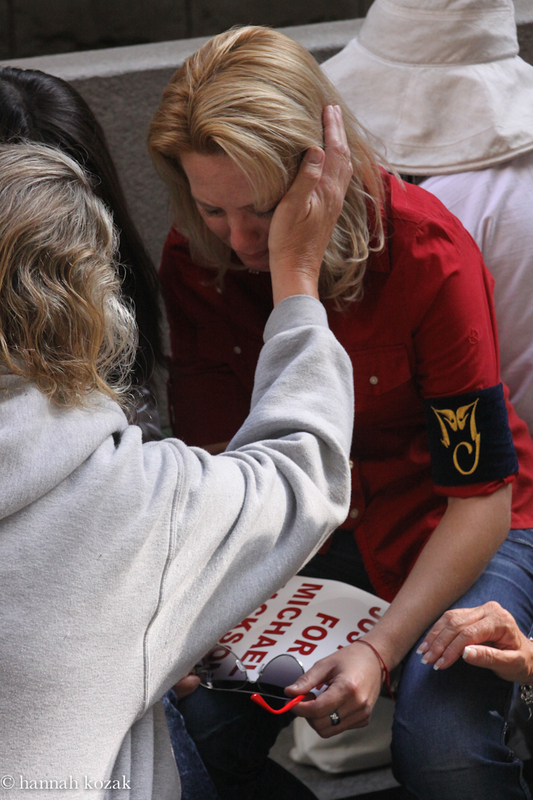 Michael said: “My message is healing, pure and simple.” Michael, we want you back. The media conveniently forgot about and tried to cover up that Chandler didn’t call child services but instead called attorney Barry Rothman. Why? To get the money he wanted Michael to give him because he wanted to write movies for Hollywood and not be a dentist anymore. History was filled with emotion as Jackson’s mistreatment by the media ignited and created his most angry, raw and personal album. Michael wrote about isolation, (Stranger in Moscow), greed (Money) and the anger he felt at the injustice placed upon him & at the tabloid press (Scream). He wrote D.S. 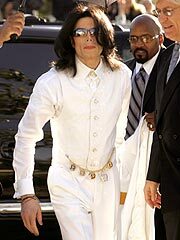 which was directed at malicious Tom Sneddon, the prosecutor in the 1993 case who had Michael’s Neverland home raided the day his new cd came out. Michael would begin using painkillers, Xanax and Ativan to deal with all the stress placed upon him with the false allegations. 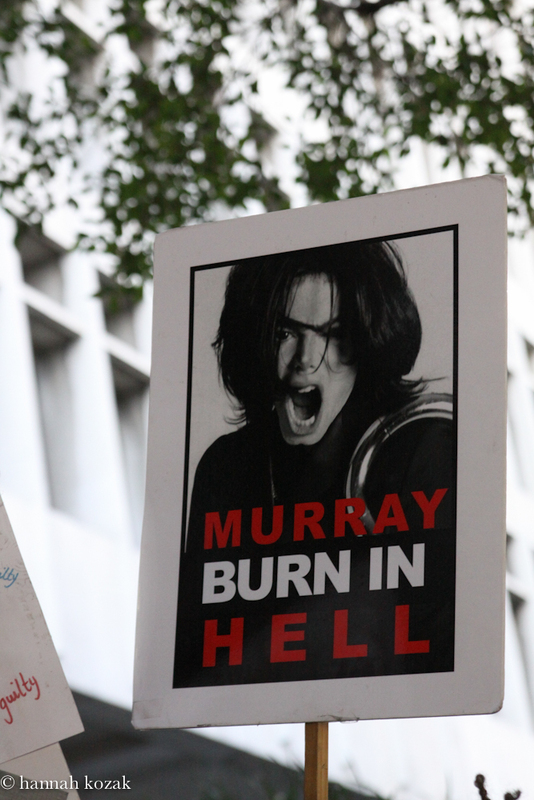 Fast forward to the 2005 trial; another witch hunt against Michael Jackson. Janet Arvizo was proven to have lied in the past to secure money from JC Penny and exploited celebrities for money. Michael was the perfect target as he helped her young son Gavin in a fight against cancer. What did Janet Arvizo want? Money. Isn’t it ironic that 16 years later, Dr. Paul White, who is being paid $3,500 a day to testify could barely answer any question asked of him in court today with a yes or no answer? We’ve all figured out that he is being paid to lie about propofol. Money. 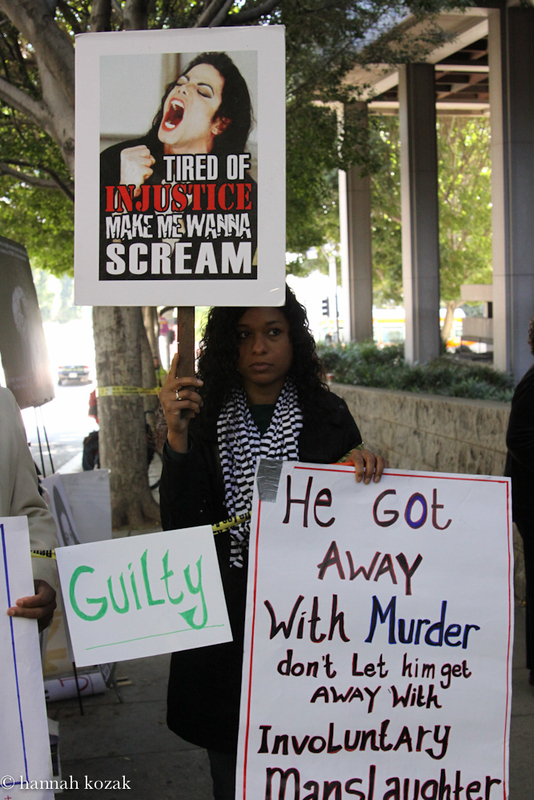 Deputy District Attorney David Walgren asked White at least 4 times, “Did Conrad Murray act like someone well skilled in advanced cardiac life support?” because White simply couldn’t give a yes or no answer and even said it was difficult for Murray to call 911 because Jackson’s bedroom was an isolated area, (“it was a bedroom upstairs” retorted Walgreen), that there was a gate with security guards and no working telephone in the house. Of course, we all know Murray’s phone records show him making 47 minutes of phone calls after Jackson stopped breathing. Incredulous! 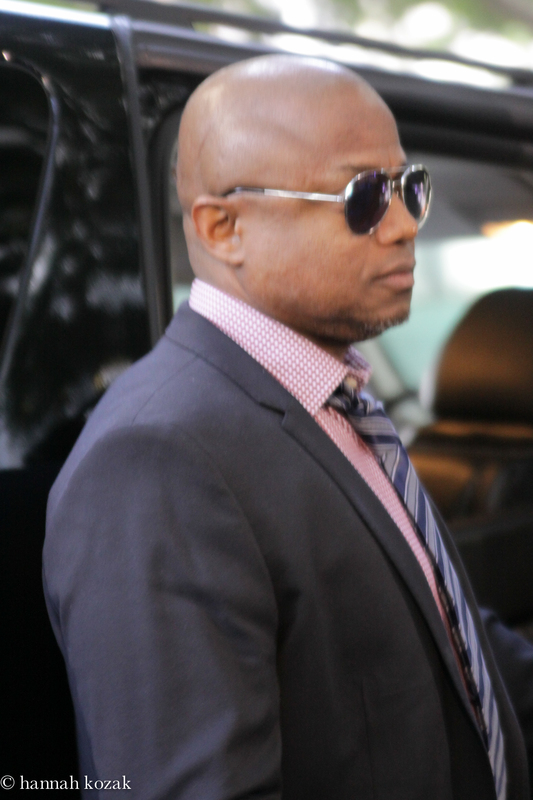 White went so far as to anger judge Pastor and at one point, Walgren was questioning White and asked “Who is responsible for bringing propofol into Michael Jackson’s home”? “Really”? Deputy District Attorney David Walgren asks sarcastically of Dr. White. “You keep throwing out rehearsed lines, I think.” Walgren says holding back his anger and frustration and says to Judge Pastor; “would the court admonish the witness?” Walgren asks/demands of Judge Pastor after his cross examination slaughters White. Pastor angrily says White is in contempt of court and fines him a measly $1000 nuts. 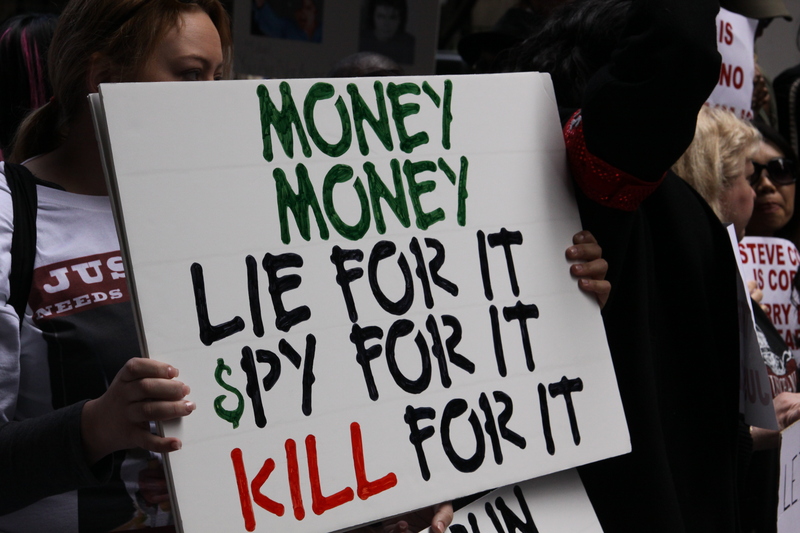 The allegations against Michael Jackson were an elaborate plan to extort money from him. Not only in 1993 and the trial of 2005 but the hundreds of lawsuits he received every year from people who wanted their own chunk of Michael Jackson’s bank account. Money. 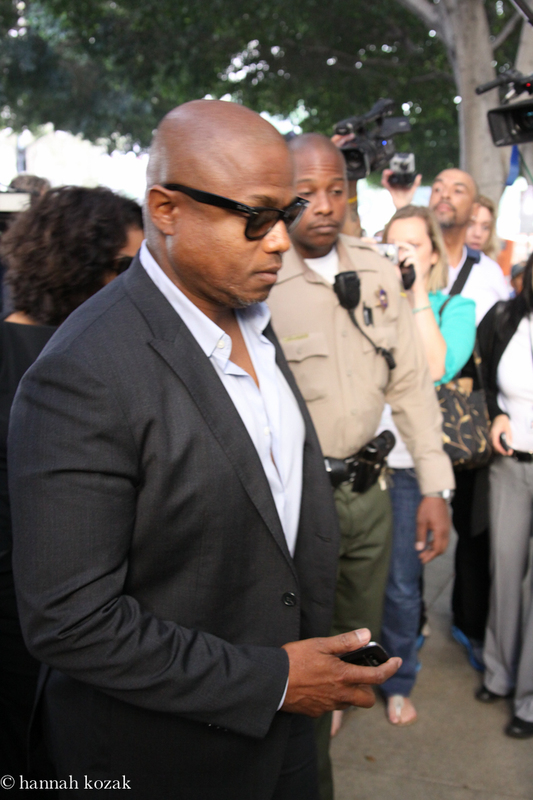 Back to the courthouse for the fourth preliminary hearing for the trial of Conrad Murray. Katherine, Joe, brother Randy and sister Rebbie arrived around 12:30 and were there for less than an hour. 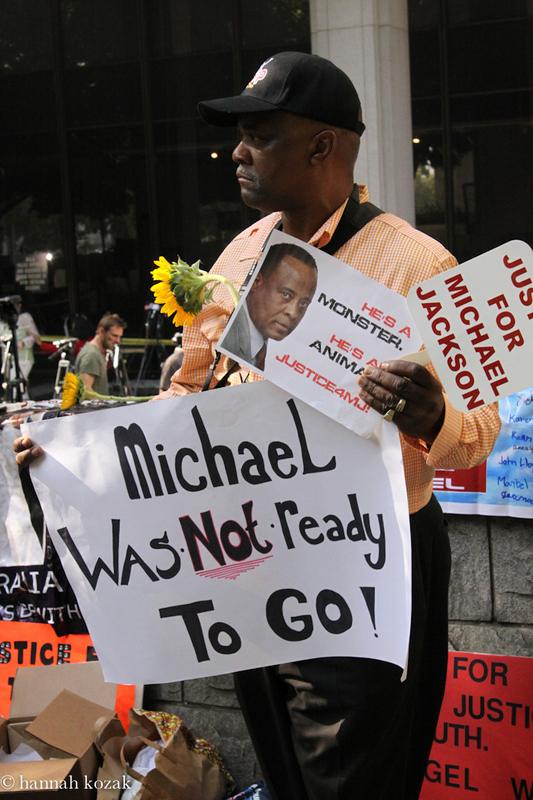 There were about two dozen fans with banners for Michael demanding justice. The question the fans keep asking: If a medical doctor used Propofol in your home on a loved one and that person died of acute Propofol poisoning, wouldn’t the doctor be held libel especially in light of the lack of a hospital setting without proper machinery. Why has the judge pushed the preliminary trial to January 4, 2011? Michael’s death has been ruled a homicide. Murray’s defense is sticking with the story that Michael woke up from an anaesthetic induced sleep – make that a coma, and gave himself the lethal injection. I’m curious why MJ would have Murray on staff at the tune of $150,000 per month if he was planning to inject himself? This defense theory is nothing short of shocking. Why are they forgetting Murray made 47 minutes of calls on his cell phone after he found Michael yet Murray states he left the room for two minutes to relieve himself. Whose responsibility is it for Michael’s untimely death? Michael? Michael’s brain needed to be monitored so the effect of the Propofol could be watched. 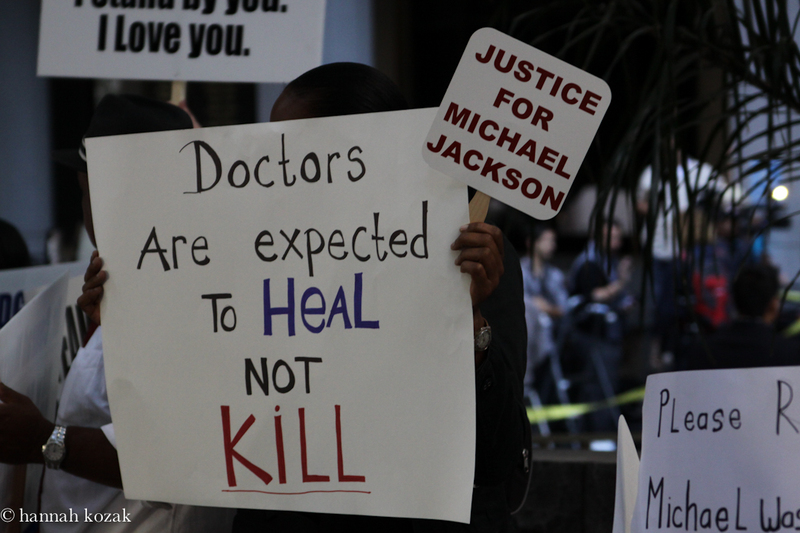 Even if he didn’t intend to kill Michael, the point is Michael died from too much Propofol. The latest strategy is Murray’s lawyers want to challenge the autopsy by unearthing Michael and proved he died from taking pain pills. As if Michael didn’t have enough people back stabbing him when he was alive, now they are considering digging him up from his grave? Wouldn’t it be easier to admit the truth, perhaps even make an apology to the family and fans? It’s emotional abuse to be denied what you need. Especially if all you are asking for is the truth. Michael’s family and fans need to hear the truth. Michael’s addiction to pain pills and anxiety reducing drugs was perpetuated by doctors. Some say the addiction began with his hair burning off his scalp during the 1984 Pepsi commercial. 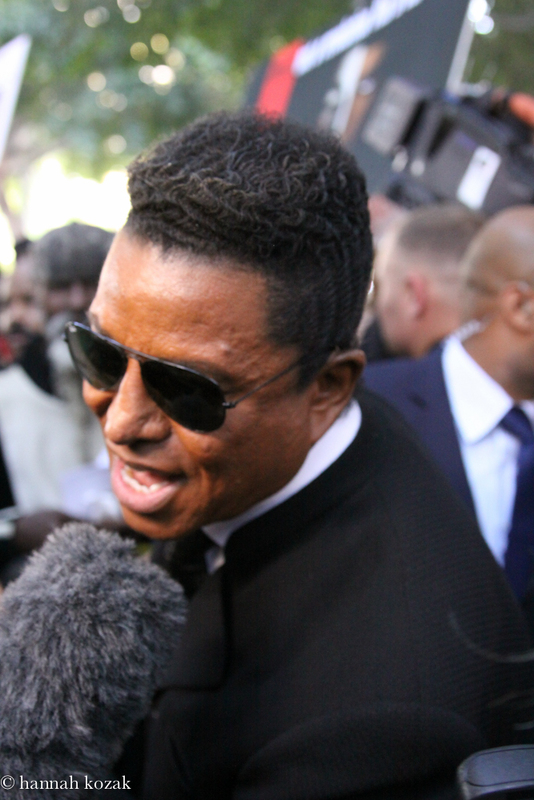 Others say it was the allegations of child abuse in 1993 in the midst of the Dangerous tour. The damage to his spine from the bridge crashing to the stage on June 29, 1999 in Munich, Germany only added to years of other injuries including another fall off the stage. The average person doesn’t have so much trauma to their body and psyche. But what does this have to do with a lethal injection of Propofol? Here’s the facts: Murray injected Michael with Propofol. Murray admits to leaving Michael alone. 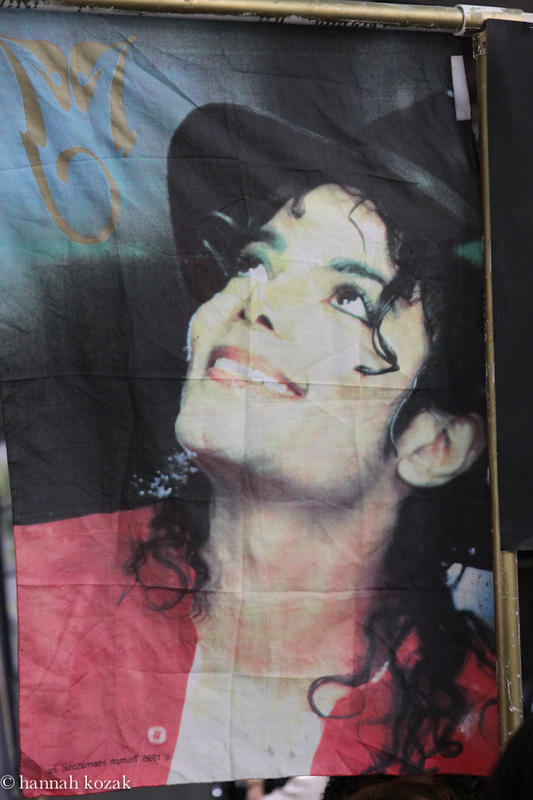 Coroner declares Propofol killed Michael. In my humble opinion, the prosecution is grabbing at low hanging fruit by charging Murray with involuntary manslaughter instead of what he committed: second degree murder. I’m not going to even get into the topic of Murray’s history of numerous law suits giving him a massive amount of money issues. Propofol has been safely administered to millions of patients since 1989, when it was brought to the U.S. As long as someone was monitoring the patient, there were no issues. EKG, blood pressure and pulse oximeter are always present. These were not present at Michael’s bedside.This drug is rarely administered outside a hospital setting. Propofol is not an intervenous sleeping pill. The first Hippocratic oath is First Do No Harm which means Murray should not have honored Michael’s request. I checked out a bottle of Propofol. On the label it says it should be administered by an anesthesiologist. I think if you are not an anesthesiologist you shouldn’t adminster anesthesia. Anyone with me on that? Money signs before common sense = whoops. Murray’s financial troubles are documented. If Murray knew he was playing with a dangerous drug, why not have all the necessary machines available? I’m just saying. 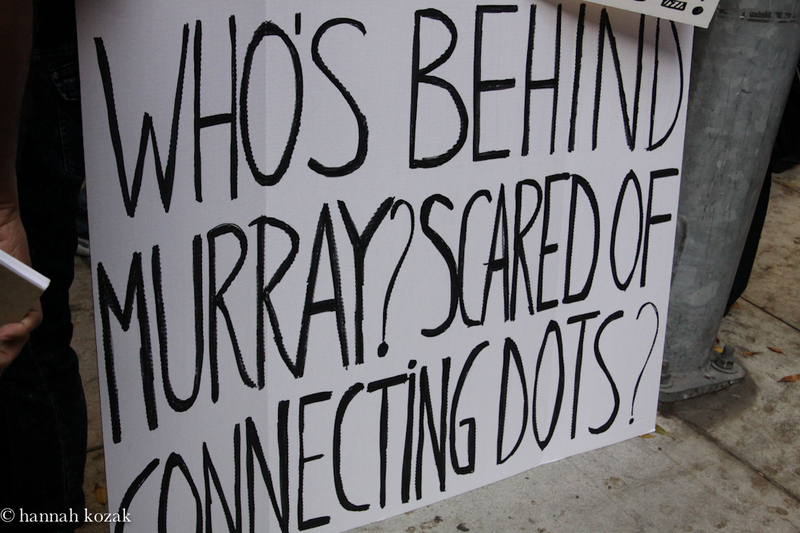 Some say Murray is greedy,unethical, and unprofessional. I personally believe Murray made a mistake. My father always taught me I have to pay for my mistakes. Who will pay for this one? Michael had Insomnia from his earliest days touring with the Jackson Five. He was under stress preparing for his first tour in over a decade. He just wanted to sleep. We’ve all heard that no one ever died from not sleeping before this tragedy. Stay tuned, more to follow. 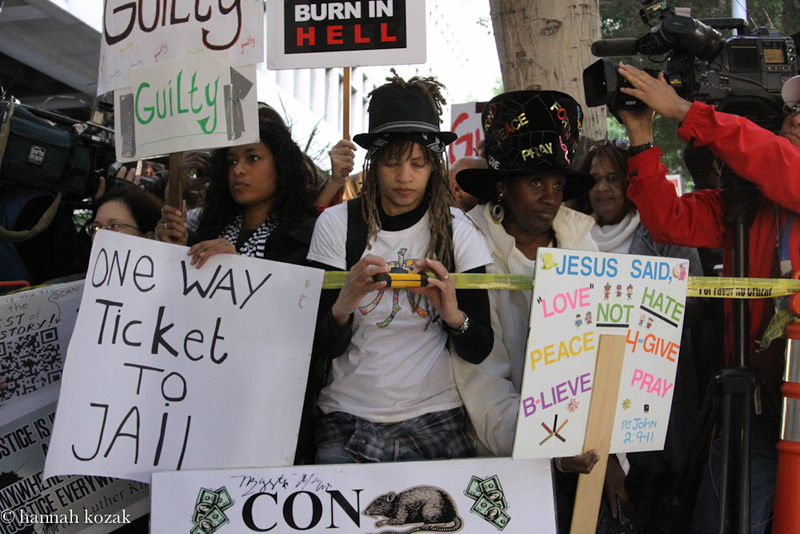 Back at the courthouse for the continuation of the preliminary Conrad Murray trial. Yes, I’m still Michaeling. I continue to be there in support of one of the most loved yet misunderstood and judged performers in history. 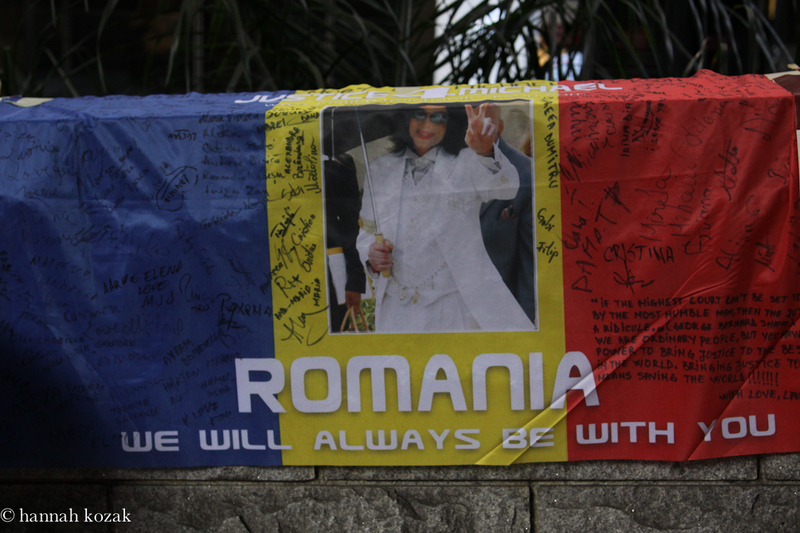 His death nearly a year ago was a cataclysmic event that continues to affect me and millions all over the globe. The approximate one hour drive to downtown Los Angeles from my home is nothing compared to some of the sojourn fans made on Michael’s behalf. 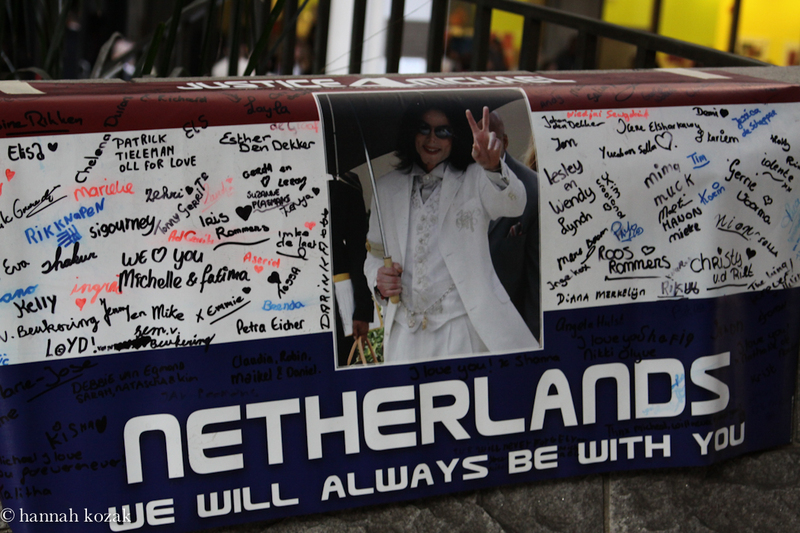 Fans from Argentina, Hong Kong, Netherlands, Romania, Russian, Spain, Malaysia made banners and signed messages. I met Marilyn and Karen from Estonia. Angela and Lucy from Germany and Barbara from Czech. 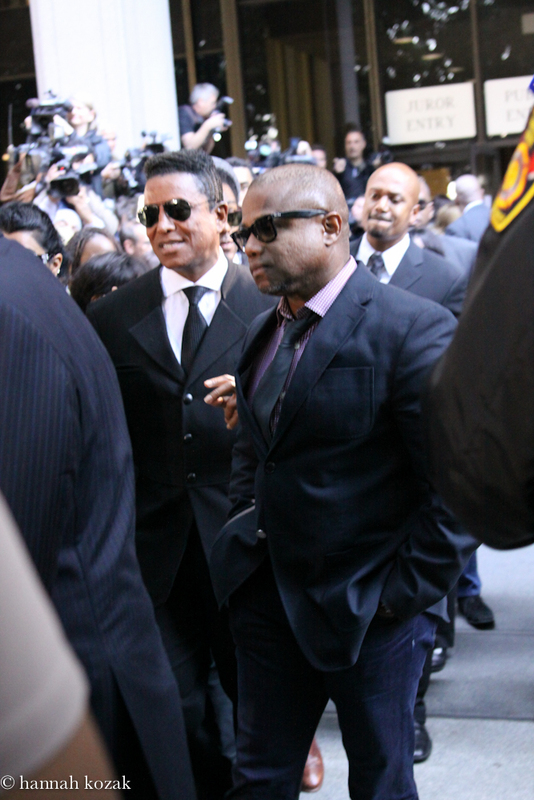 Jermaine, Joe, La Toya and Katherine came in through the rear with Randy making his way through the fans lined up at the front. I decided to wait in the back for their exit and through the back door they came. I wasn’t quite as aggressive this time as the last when my camera was confiscated for taking pictures inside the court house. 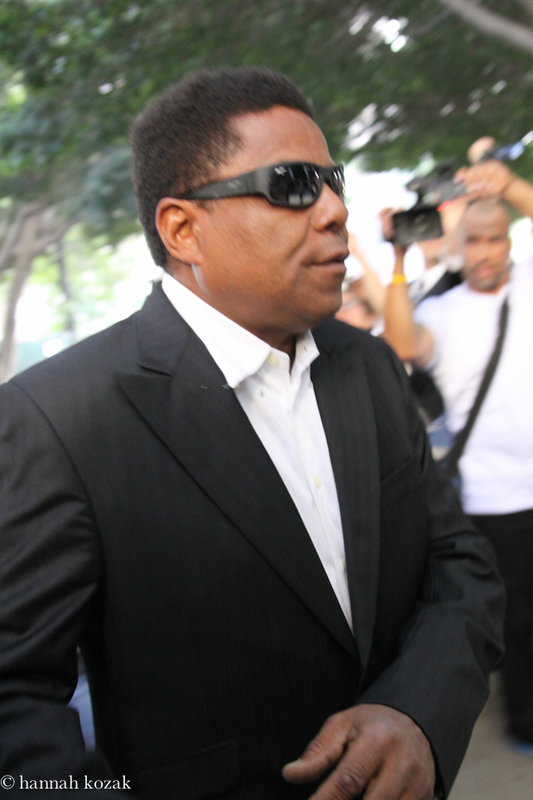 Conrad Murray didn’t come in through the front or back, he was snuck in the underground garage. 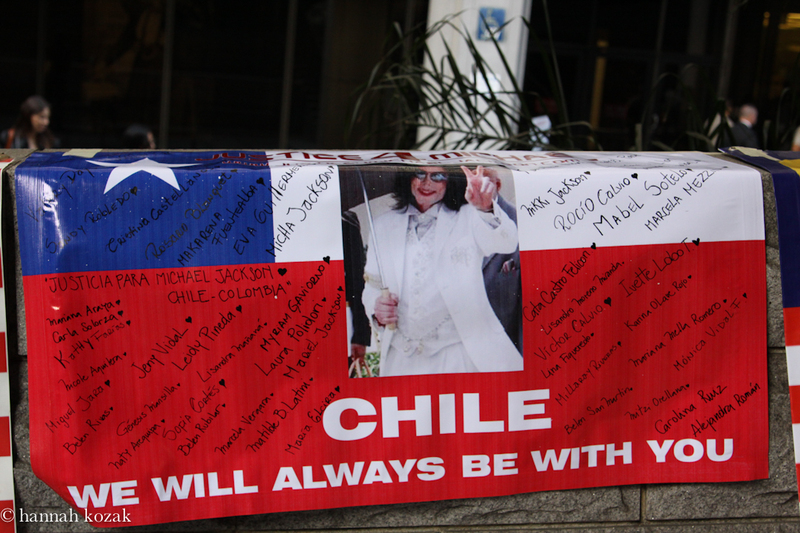 I’m attaching photos to try to give you a sense of the powerful dedication MJ’s fans continue to hold for him and his family. Millions if not billions of people all over the world continue to support and love him. I’ve spent countless hours reading about him which has brought me an understanding that Michael, more than anything, loved big. He was so gossamer that it had to be difficult living in his shoes. All his light constantly being snuffed out by dark. The insomnia that started so young. I imagine it would be difficult singing to hundreds of thousands of people on stage where the auditorium is a lovefest and then go home and sleep. All that love coming at him for over four decades. Sometimes I have a hard time sleeping when I’m in love. Michael’s death is a lesson in more ways than one. Not to waste a single moment of life. I’ve been writing for decades and not sharing a word. Sometimes a story here or there with an intimate friend but the rest was kept under lock and password. No more. What happened to Michael reminds me of the media and Princess Diana. The press loved to focus on her anorexia, bulimia and depression instead of the charity work she did for children and eradicating land minds. With Michael, the press focused on his surgeries and skin color instead of his colossal charity work.Those of us who saw the beauty of his soul looked beyond the surgeries. We know that victims of child abuse often develop psychological problems such as Body Dysmorphic Disorder. We focused on his caring, loving spirit. Before and after concerts whenever he toured, Michael would visit sick and dying children. The press preferred to sully his name. Salacious allegations sell more newspapers than hospital visits to children with Leukemia, cancer and aids. Michael’s life was backwards in some ways. He was an adult when he was a child and a child as an adult. Watching videos of him between the time of Off The Wall and Thriller, I saw a boy in a man’s body whose favorite word was magic. In one interview of 1984, he said magic six times. He smiled and laughed a lot. 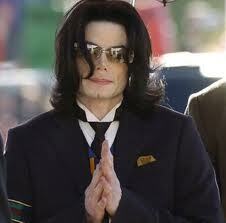 By the end of the trial in 2005, not only did he not use the word magic but his light was gone. The media pummeled it out of him. In This Is It, his light returned. Even after he had been vilified by the mass media and forced to leave his homeland, Michael’s light returned. “We want to take them places they’ve never been before. It’s all for love. L-O-V-E”. His life’s work, in part, was to give us magic. He gave us great lessons. Even though he was the innocent victim of extortion engineered by greedy, corrupt adults,which was proven in both cases of the allegations against him, he kept loving. 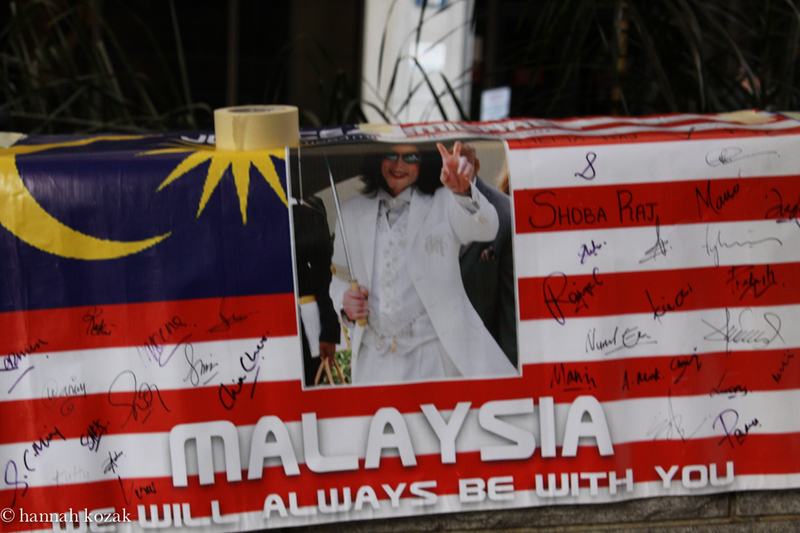 Even though he reportedly had over 1,500 lawsuits where people tried to get a piece of his wealth, he kept loving. He kept loving and forgiving in spite of all the judgements aimed at him.